This unusual name is of Anglo-Saxon origin, and derives from a combination the Olde English pre 7th Century personal names "Aethelnoth", "Aelfnoth", and "Ealhnoth". These are all variants of the name "Athelnoth", which is composed of the Olde English elements "athel", noble and "noth", daring. The given name is recorded in a variety of forms in the Domesday Book of 1086; "Aelnod", "Alnoth", "Alnot", "Alnod", "Elnoc" and "Elnod", while the surname development has included William Alnath (1273, Wiltshire), Cecil Aylnet (1273, Oxford) Gilbert Elnod (1312, Kent) and Thomas Alnowe (1427, Essex). 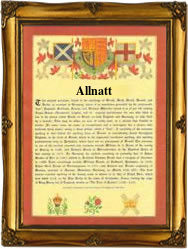 The modern surname can be found as "Allnutt", "Allnatt", "Allner", "Alner", "Elnaugh" and "Elnough". The marriage of John Allnutt to Mary Hatchet was recorded on the 19th October 1703, at St. Mary's at Hill, London. The first recorded spelling of the family name is shown to be that of William Aylnoth, which was dated circa 1200, in the "Lewes Chartulary (Norfolk)", during the reign of King John, known as "Lackland", 1199 - 1216. Surnames became necessary when governments introduced personal taxation. In England this was known as Poll Tax. Throughout the centuries, surnames in every country have continued to "develop" often leading to astonishing variants of the original spelling.